Mystery plays date back to medieval times, when groups of local people would perform sets of popular religious plays, telling key bible stories from creation, Jesus' life and death, to the last judgement. From about the eleventh century, plays on biblical subjects were acted out in church by the clergy. These plays became very popular, and eventually moved out of the church into streets and marketplaces, to be performed in English, by lay people, on religious holidays. The performers who took over from the clergymen were mostly members of craftsmens' guilds which were commonly known as 'mysteries', from the Latin 'mysterium', meaning 'handicraft' or 'office'. Thus, the plays they performed came to be known as 'mystery plays'. The plays evolved to include topical social themes and comic scenes and jokes, with wildly extravagant costumes and special effects, although the emphasis remained on the message of God's relationship with man and on the promise of salvation through Christ. The mystery plays would often be performed around the feast of Corpus Christi, which normally falls in mid-June, in an atmosphere of great festivity. The guilds performed on decorated carts called 'pageants', with each play being performed by a particular guild, on a separate cart. On the day of the festival the pageants travelled in procession through the town. Each pageant stopped at each street to perform its play, and then moved on, to be replaced by the next pageant, performing the next episode in the sacred drama. Although each play was fairly short, the complete cycle of plays took a very long time, sometimes more than three days! A separate subgroup of plays telling the Easter Passion stories developed, and were often performed in Holy Week. Alongside mystery plays there is a tradition of country drama 'mummers' plays. These folk dramas also involve travelling bands of local performers, and the stories, although at first glance appearing to be more secular, share the themes of resurrection and the triumph of good over evil with the passion and mystery plays. 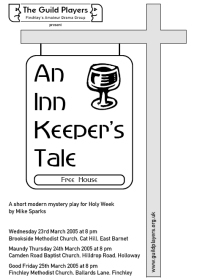 Mike Sparks' modern piece draws on the traditions of both - a folk drama of the Easter story, acted by local people, travelling to different venues, and combining performance, celebration and worship.